Update 3/29/18: Removed reviewer CPayseur at his request. 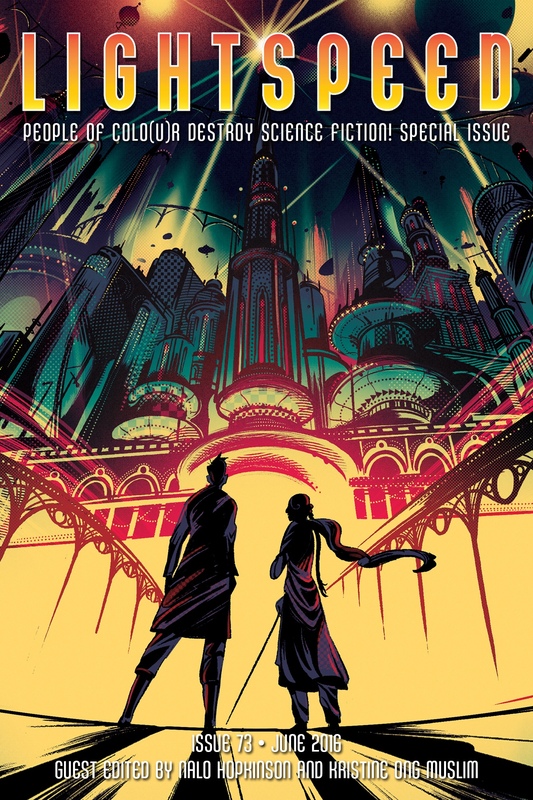 Also see discussion of request by Hugo finalist Camestros Felapton. In the spirit of Lightspeed Magazine's famous People of Color Destroy Science Fiction series, here are 92 stories by people of color that had a combined score of 2+ from RSR's 2015 & 2016 Best SF/F lists. The two lists together contain the 440 most-recommended stories out of 1,481 reviewed, so the 92 stories by people of color make up around 21% of the best of 2015-2016. Readers asked us to make it easy for them to find good stories written by authors with diverse racial backgrounds, and that’s what this list is meant to accomplish (author identity plays no role in our ratings). Note that this is for fiction from 2015 and 2016 (RSR started September 2015); and we’ll prepare a similar list for 2017 once the finalists for various awards have been announced—probably in July or August. Please leave a comment if you see a story by a person of color in our 2015 Best SF/F or 2016 Best SF/F lists that isn't included here, or if a story here isn't by a person of color. We browsed author bios on the web to identify people of color but with hundreds of authors to look up, it's easy to make mistakes. Thank you. 📙Going by "year's best" anthologies, BASFF recommended 29, RHorton 21, GDozois 16, JStrahan 16, and NClarke 15. 🏆From 2015-2016, 12 of 37 short fiction Nebula, 10 of 33 short fiction Hugo, 5 of 10 Eugie, 18 of 45 short fiction Locus, and 4 of 21 Sturgeon finalists were from this list. The Sturgeon Award seems to be the outlier at 20% compared to the 33%+ for the others. This grouping sorts stories by the sum of their recommendations and is useful for people who want to read the ones with the most recommendations from major awards, year's best anthologies and prolific reviewers. You can track your progress through big lists on RSR by flagging and rating stories with the drop-down next to each story title. This grouping shows Lightspeed/Fantasy Magazine published the most stories in this list at 20 (thanks to their POC Destroy SF/Fantasy series) but Clarkesworld was close at 14 (thanks to their focus on translated stories). They're followed by Tor.com (9), Asimov's (7), Tor novella (6), Beneath Ceaseless Skies (4), and Uncanny (3). These magazines certainly published more stories by people of color, but those didn't get enough recommendations from prolific reviewers, year's best anthologies, and awards to get into this list. This grouping has 5 Campbell-eligible authors, with scores that show relatively few recommendations, which is not a surprise for new writers in their first or second year. This grouping shows 60 authors, with the most prolific being Aliette de Bodard (5), Yoon Ha Lee (4), Ken Liu (4), An Owomoyela (4), Alyssa Wong (4), Kai Ashante Wilson (3), and Caroline Yoachim (3).